There’s an old adage that says, “It’s not what you know, but who you know,” and that concept has never been truer than it is today. In just about every industry, your success is directly related to your networking abilities. We want to help you navigate the somewhat murky waters of industry-specific networking, but before we do, there are some universal rules of networking etiquette to be aware of — and they apply no matter what your profession may be. When attending a network event, always look for opportunities to contribute. Be aware of people standing alone or having a hard time acclimating. Go over and introduce yourself, get to know them and introduce them to others who might share the same interests. Look for opportunities to offer your assistance and expertise without expecting any return. People will notice and be more likely to return the favors. Get to know individuals, not businesses. Let people know their story is important to you by really listening to what they say. Do your research on those you’re likely to meet and look for common interests. If someone has had a recent victory, take the opportunity to bring it up and compliment them on their success. Always be honest and real with people as well. Don’t try to hide your background or portray yourself as someone you’re not. You’ll find that making genuine connections will take you a lot further than randomly handing out hundreds of business cards — and it’s a whole lot cheaper. If you promise something to a potential contact, always follow up and deliver. Get their business card and as soon as you can, make a note on the back of that person’s card so you don’t forget what you offered to do for them. It’s important to note however, that following up is not the same as stalking, and making a connection doesn’t equate to being best friends. Be aware that the people you meet are often busy, so make sure you respect their time. It’s also important to treat personal information with the utmost discretion and never share it without specific permission from that person. Now that we’ve covered some basics let’s look at more industry-specific tips. Let’s start with non-profit organizations because rather than selling yourself, as would be the goal in most industries, a non-profit’s objective is to raise funds. This can be tricky, so it’s important to educate yourself on how to identify potential supporters and even learn how to work with other non-profit organizations. Networking between organizations can lead to building jointly advantageous alliances, which could increase each cause’s influence and fundraising abilities. Though many organizations expect general growth would enhance money-raising efforts, very often the increased overhead to compensate that growth outweighs any anticipated benefits. By networking with other similar causes, however, non-profits get the benefits of a larger organization while maintaining smaller operating costs. You can also put some of the same strategies in play for networking as you would for fundraising. It’s the same thing, really. You’re looking to get the interest of someone, and connect on a shared goal. You can use social media to network the same way you would use it in a fundraising campaign, for example. Or, show you know how to mingle at an event like you would at a fundraiser. While networking in non-profits can be an organizational effort, when it comes to business networking, you’re on your own. That’s why it’s important to start by defining your goals and determining what you want to gain by your participation. Are you looking for new opportunities, education or maybe a mentor? Be sure you are clear on what you want and how others can help you. Visit several groups until you find one that provides what you’re looking for. Once you’ve found the right one, make yourself visible. Volunteer for positions within the organization and become a strong resource for other members. Make sure you always follow up on any referrals you are given because your actions reflect on the person who made that referral in the first place. The best way to gain the group’s trust is to be someone they know they can depend on. Also, don’t neglect your online presence. Be sure your LinkedIn profile is always up to date, and take care not to show yourself in an unflattering light on other social media sites. Treat your online connections with the same respect you do your in-person contacts. A great way for healthcare workers to kick off their networking efforts is to join and stay active in professional associations. This gives you access to others in your profession and helps keep you abreast of what’s happening in your industry. If you’re already working in your profession, take advantage of that time to increase your number of connections through mutual contacts. Never underestimate the value of any referrals — even if they aren’t directly related to your profession. Conferences and seminars are excellent opportunities to meet new people and make valuable alliances that can provide benefits for you in the future. Also be sure to connect with your current associates on LinkedIn or other industry-specific social networking sites. Just remember, as with any other industry, your contribution to the growth of your peers’ and subordinates’ careers will reflect back on you. Always be willing to reach out and provide the same assistance to others that you’ve been given. It’s not surprising that most networking in the tech industry happens online. There are a number of online social networks geared specifically toward today’s techies. While most of them are informational, many do include chats and message boards as well. It’s important for tech professionals to also branch out into other areas. Because information technology is a part of almost every company worldwide, you can expect to make valuable contacts from any industry gathering. If you want to have some real time with others in your profession, there are several conferences and trade shows hosted by different technology-related companies throughout the year. A quality, up-to-date online presence is imperative for professionals in this industry, and it’s also a good way to make you stand out from others in your business. 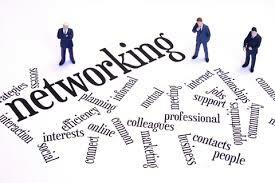 Networking is about building mutually beneficial relationships and connecting individuals who pay forward the support and promotion they receive from others. Whether you connect online or in the flesh, relationship, respect, responsibility and reciprocation are the four keys you need to be successful in your networking endeavors. This entry was posted in General, Social Media, Transition Advice and tagged career transition, industry networking, job search advice, job search networking, military to civilian transition, networking tips, transition advice by Karin Durkee. Bookmark the permalink.